Koh Samui is an island in Thailand that is part of the Chumphon Archipelago in the Gulf of Thailand. It's an island that has a lot of natural beauty and very nice beaches. Tourism is a major industry here and the high number of tourists is starting to have a detrimental effect on the natural beauty of the area. Still, this is a top travel destination for backpackers to Southeast Asia. There is no shortage of places to stay in Koh Samui. You should consider what you want to do on the island when choosing where to stay. If you're looking for a party, Chaweng and Lamai have the most active night life. If you want a more mellow beach experience, Mae Nam and the South Coast are better options. Bophut has a little of both and Choeng Mon offers a more quiet retreat. 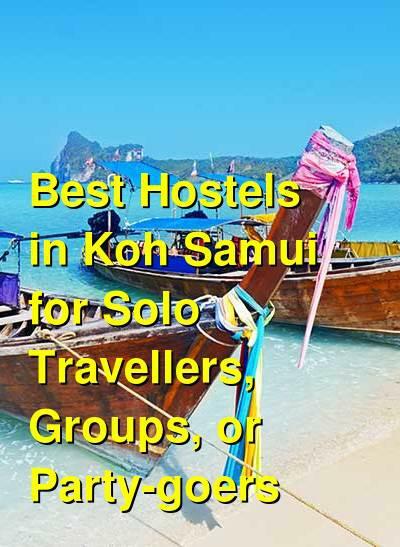 How much do hostels in Koh Samui cost? Chill Inn Beach Cafe & Hostel is located about two kilometers south of Lamai Beach. It's a bit removed from the main party area but it is located on a nice beach. There's also a shuttle bus that can take you around but it takes about half an hour. The hostel is made up of two bungalows and a main building. Each bungalow has two dorm rooms that sleep either four or six people and the main building has six and eight bed dorms. All of the rooms are comfortable and air conditioned. There are also several great common areas that stay active and social. It's easy to meet other travelers here and it won't be long before you've made a few friends. The hostel has a bar and cafe as well that looks out on the beach. The views are excellent and this is the perfect place to unwind after a busy day. You can also enjoy both Thai and western food at the cafe. The hostel is managed by both an Irish and Thai backpacker. Between them, they've spent time in Europe, Asia, Central America, South America, Thailand, New Zealand, and Australia. A good hostel for nightlife and the full moon party. If you're planning to take full advantage of the party scene in Koh Samui, then this is the place to stay. It's a three minute walk from the beach, five minutes from Soi Reggae, and twelve minutes from the center of Chaweng Night Life, where you'll find plenty of night clubs and bars. It's also about a twenty minute drive from the ferry pier that will take you to the Full Moon Party on Koh Phangan. The hostel itself is a bit small. It's really just one large room with fourteen beds, so depending who is staying there the atmosphere can vary a lot. The staff do know all the best parties and can tell you everything that's going on while you're in town. The one room is air conditioned and every person has a free personal locker. Each bunk also has a reading light and outlet. The hostel also has a bar and restaurant on-site and guests receive a discount on food and drinks. This hostel is a simple and comfortable place to stay that is close to everything. The location is really what makes the place. It's a clean, affordable, and fun place to stay for backpackers who want to make the most of their days and nights in Koh Samui. Casa Luna is a favorite hostel in Koh Samui for backpackers and budget travelers. It's located less than 20 meters from the beach and nearby you'll find several beach bars, a beach club, and a swimming pool. The Big Buddha Pier is just across the street where you can catch a boat to Koh Phangan and the Full Moon Party. The airport is also just a kilometer away. If you want to head out to the popular night life area of Chaweng, then it's about a ten minute drive and Fishermans Village is about three minutes away by car. The hostel itself is a bit outside of town but the area is quiet and pleasant. In general, it's a good value for the money. The hostel has two co-ed dorms available that each have air conditioning and bunk beds and sleep either six or ten people. Guests have access to their own reading lights and power outlets. There's also one private double room available if you want a little more privacy.